After a two-day monetary policy meeting, the Federal Reserve's Federal Open Market Committee decided to keep interest rates unchanged on Wednesday. Nonetheless, that decision didn't alter their hawkishness on the state of the economy after they upgraded it to "strong." With the Fed's vote of confidence in the economy, the prospect for more rate hikes to come through the rest of 2018 is almost certain. The Fed stated that the labor market has "continued to strengthen," fortified by evidence of data regarding private payrolls, which increased in July by 219,000 versus an expected 185,000. As such, one ETF to watch is the iShares Floating Rate Bond ETF (FLOT), which tracks the investment results of the Bloomberg Barclays US Floating Rate Note < 5 Years Index. The ETF focuses on investment-grade floating rate notes that track the underlying index, which has been on an upward trajectory looking at its year-to-date chart. Like FLOT, the SPDR Blmbg Barclays Inv Grd Flt Rt ETF (FLRN) features a floating rate component that will be beneficial in hedging interest rate risk. 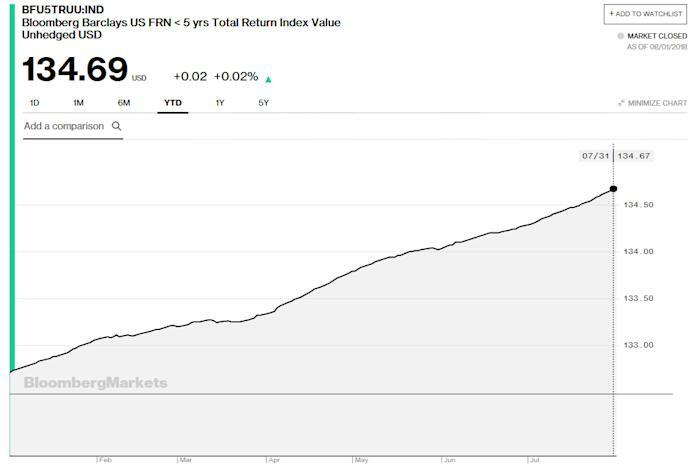 FLRN also seeks to provide investment results that correlate with the price and yield performance of the Bloomberg Barclays U.S. Dollar Floating Rate Note < 5 Years Index. FLRN limits duration exposure with investments in debt securities with maturities that don’t exceed five years. In addition, at least 80% of its assets will be allocated towards securities comprising the index, such as U.S. dollar-denominated, investment grade floating rate notes.